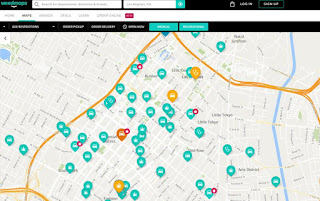 This frame from the Weedmaps website shows part of the map section of the online cannabis directory. State regulators have warned the popular website to take down ads from illegal sellers that appear or face possible penalties, but the company says it’s not breaking any laws. But legal and illegal operators advertise next to each other, and licensed operators in California say that's put them at a disadvantage in a cutthroat marketplace. To them, Weedmaps is helping illegal sellers flourish without having any of the obligations licensed operators endure — collecting and paying taxes, insuring their businesses and employees, and abiding by safety rules for their products. In other words, illegal shops can sell pot at cheaper prices, sometimes 30 percent to 50 percent less. "That's Weedmaps' business model, to confuse the difference between legal and illegal," said Jerred Kiloh, a licensed dispensary owner in Los Angeles who heads the United Cannabis Business Association, an industry group. "It's an unfair playing field. They are pitting us against each other." In a response, Weedmaps executives said they are eager to work with the state but asserted that the online directory doesn't fall under state authority and is shielded by provisions in federal law. The company sees the core of the problem as a scarcity of legal outlets and hefty taxes that scare off consumers from licensed shops, not its online ads. In Los Angeles, where the pace of city licensing has been sluggish, only about 130 retail shops have authority to operate, while city officials acknowledge hundreds more are making illegal sales. Weedmaps says its experience dropping unlicensed businesses from its listings in Washington, Oregon, Nevada and Massachusetts had no impact on the size of those unlicensed markets. "Scrubbing the internet of the reality of unlicensed operators ... does nothing to fix the underlying issues," Weedmaps CEO Doug Francis and President Chris Beals wrote to the state Bureau of Cannabis Control earlier this month. But Kiloh is among those who argue Weedmaps is far more than an advertising platform, noting consumers can use the site to submit orders and summon deliveries from shops legal and otherwise. "They are acting like Amazon, saying, 'Here is a shopping cart,'" Kiloh said. "They are creating a marketplace, not a platform for advertising, and it's driven by dollars." Complaints have surfaced elsewhere, including over fees that in some cases can be tens of thousands of dollars a month for prime ad space. The company says some advertisers pay nothing. "I strongly believe their response to advertise for unlicensed cannabis companies is a black eye to the industry," said Peter Marcus, a spokesman for Boulder-based Terrapin Care Station. Terrapin has five licensed dispensaries in Colorado and has advertised with Weedmaps for years, Marcus said. He said Terrapin worries Weedmaps' high-profile spat with California regulators will bring unwanted attention from the U.S Justice Department, which continues to prosecute marijuana offenses under federal law that still sees cannabis as an illegal drug. The appeal of black-market shops — and the lure of their ads — was illustrated this month after a raid at an illegal dispensary near Los Angeles. 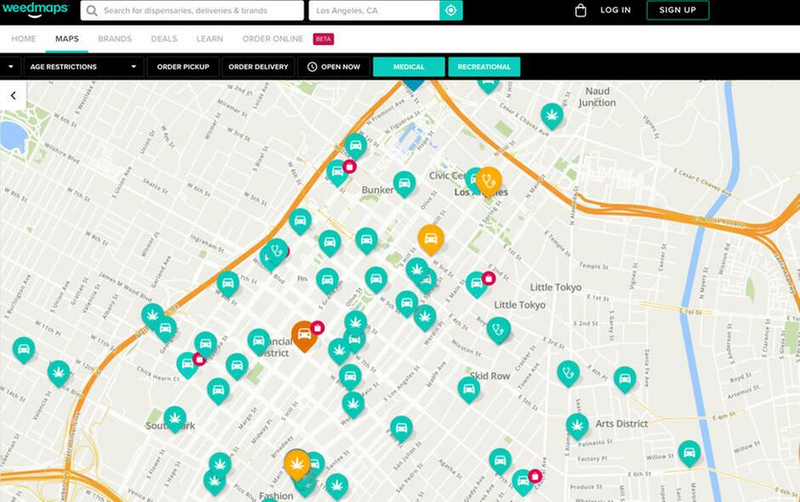 Even after Los Angeles County sheriff's deputies shuttered the Compton 20 Cap Collective, hauling out employees and customers in handcuffs and seizing bags of illicit pot, the shop's page on Weedmaps advertised deals and displayed the dispensary's products, which included dozens of varieties of cannabis buds, extracts and edibles. Despite the bust, prospective customers were asking about making purchases. "Are they back open again?" one comment read. In its warning to Weedmaps, one of hundreds of letters sent to businesses that California regulators believe are operating improperly, the state said the company should take down ads from illicit operators and warned the company it could face criminal penalties. The company said in a statement it wants the licensed market to reach a "functional state where the unlicensed market is minimized." California regulators are discussing appropriate next steps, state cannabis agency spokesman Alex Traverso said in an email.